Shelly's Note: I friggin' love this recipe. I love it so much that right after I made it the first time, I was unable to contain my excitement and wrote a nonsensical e-mail to a close friend about it. 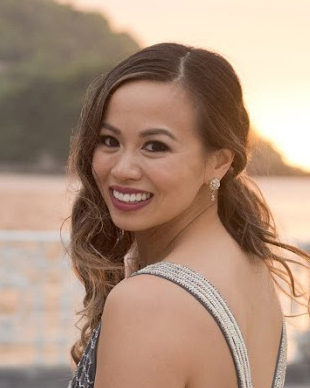 I think that the best part about it all is that it happened as a happy accident - two things that I never thought to put together but turned out just right. It all started when I was starving post-spin class, but feeling too indecisive to order takeout. Usually I have something quick in the fridge to eat - leftovers to finish, eggs to scramble, something, anything. But this was one of those nights when I had absolutely nothing. Not wanting to resort to eating Top Ramen after a great workout, I started to brainstorm through my pantry and found a jar of Masala Simmer Sauce that I bought on a whim at Trader Joe's. When I initially bought it, I fantasized about using the sauce to make Chicken Tikka Masala, but of course never got around to it since Indian delivery is just so much easier! Then, I dug some more and found another forgotten pantry item that I bought with the good intention of using but never touching: red split lentils ( also bought on a whim at TJ's - notice a pattern here)? And so begins my new love affair with my two neglected pantry items, Masala Simmer Sauce + Red Split Lentils = Red Lentils Masala. I've been wanting to incorporate more legumes in my diet but have been unsure how, which is why I never bothered touching these lentils. 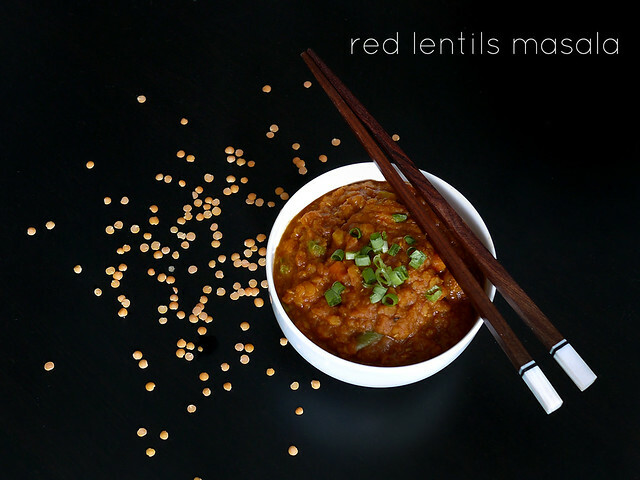 However, from reading the package, I realized that these red split lentils cook in half the time of the green lentils I normally use for lentil soup. This made it perfect for my need for a quick meal. So I quickly cooked the lentils, and then poured about half a jar of the masala simmer sauce in the same pot the lentils were. Heated through the sauce....and that was it! Ate it with some left over brown rice and fell in love. The rest is history. This really came together in less than 20 minutes, with most of my time spent showering as the lentils cooked. It's still a shocker to me that it tastes so good. Like legit Indian delivery but probably half the fat good. All this gives me a reason to never bother ordering a vegetable-based Indian dish for delivery ever again. 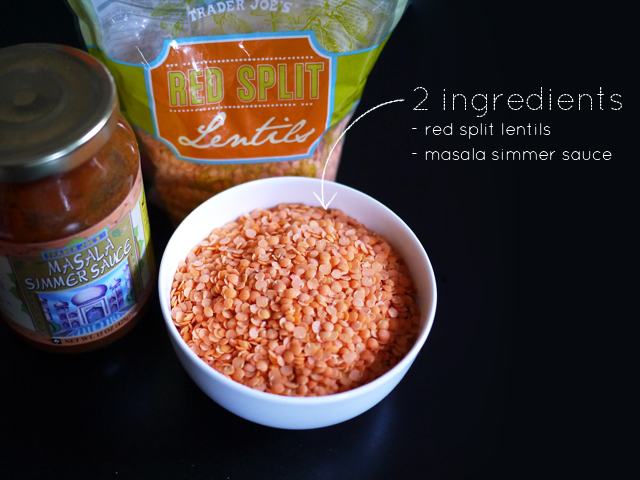 So the next time you're at Trader Joe's, I urge you to pick up a bottle of Masala Simmer Sauce and some Red Split Lentils to recreate this easy pantry dish that's not only quick and easy to make, but simply delicious. 1. Wash lentils & cook. Measure out the lentils and rinse it under cold water. In a medium saucepan, heat up olive oil on medium heat. Add lentils and fry until the oil's mixed in to the lentils. Add water, heat till water's boiling then turn down to low heat. Cook until lentils are soft, about 12 minutes. I wanted to add more substance to my dish so I added some frozen mixed veggies to the lentils as it was cooking. This is optional. 2. Add Masala Sauce. 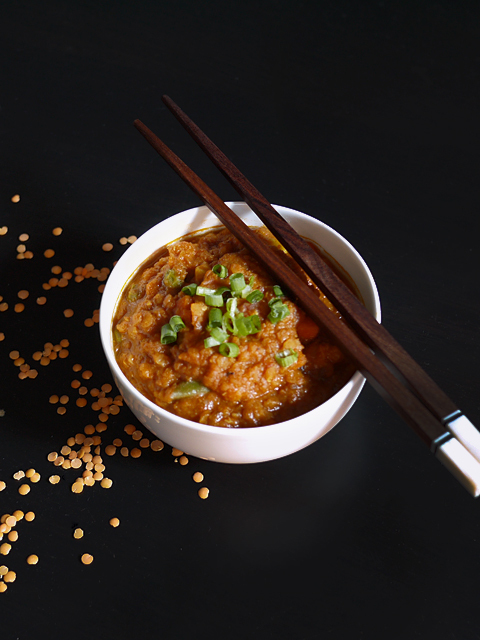 When the lentils are cooked, stir in the masala simmer sauce. Mix and incorporate sauce into the lentils. If the mixture is too dense for you, you can add a tad more water. Heat until sauce is hot, turn off heat. 3. Add shallots (optional). One more thing that I did with my dish was adding some fresh minced shallots at the end to the hot mixture. Don't think it's necessary, but I had it and added it for some extra bite to the dal.